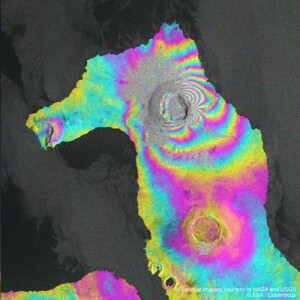 On the left side, the Landsat 8 satellite image shows the volcano after the eruption (September 7, 2015). 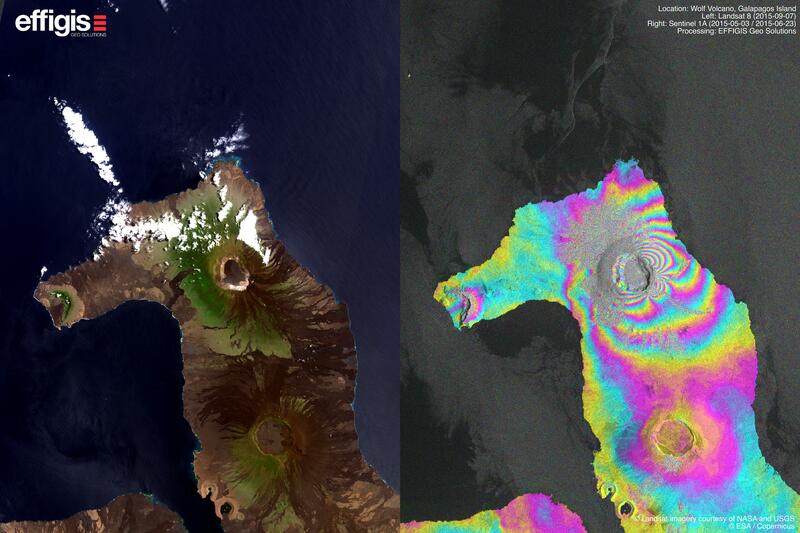 The image to the right corresponds to an interferogram created out of two Sentinel 1A radar images (May 3 and June 23, 2015). The coloured fringes, known as interferometric fringes, target the deformation that occurred on the Earth’s surface only a few weeks after the eruption. A displacement of approximately 2.8 centimetres between each colour cycle can be seen, giving a maximum displacement of about 28 cm. Radar interferometry is a technique used to detect very tiny deformations and structural movements with centimetre and millimetre precision.